This is the pre-amplifier that was product of the year in Japan and many requests have been made during the last decade to manufacture them again. 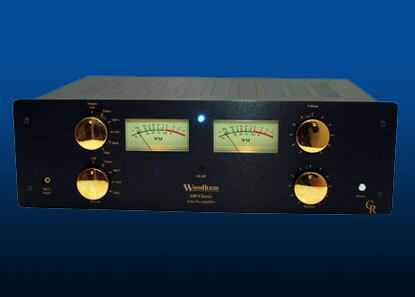 Finally this year we gave in and built a small number of Woodham Pre amplifiers to fulfil advance customer orders. Following these initial sales, production of a few of these top class pre-amplifiers each year will begin in 2015. There will be few changes to a circuit design that was so highly regarded, so the performance remains faithful to the original sound quality. However the styling changes transform the retro apperance of the original pre-amplifier for the new production, the anodised black or silver front panels and improved larger Vu meters continue to produce a professional style with a more conservative appearance sympathetic to other Hi FI separates. Input sources are complemented by a front panel mounted 3.5mm socket for MP3 analogue input, while source selection is accomplished using high quality miniature relays. The line level pre-amplifier stages are arranged on the PCB in a dual mono configuration to minimise cross talk wherever possible. Careful attention to star earthing reduces hum and residual noise. The line level pre-amplifier stages are arranged on the double-sided PCB in a dual mono configuration to minimise cross talk wherever possible. A mix of single ended and balanced input and outputs are provided to ensure compatibility with a wide range of input sources and power amplifiers. Single ended and balanced input and outputs are provided to ensure compatibility with a wide range of input sources and power amplifiers. For the phono input, 3 triodes are used per channel for gain and equalisation. Accurate RIAA equalisation is achieved using some negative feedback, and close tolerance polypropylene capacitors carefully selected for this sensitive part of the pre-amplifier. A separate stainless steel chassis houses the external power supply for this 2-box pre-amplifier. Future development of a high performance power supply is planned.